Welcome to Bascom, North Carolina, where it seems that everyone has a story to tell about the Waverley women. The house that’s been in the family for generations, the walled garden that mysteriously blooms year round, the rumours of dangerous loves and tragic passions. Every Waverley woman is somehow touched by magic. Claire has always clung to the Waverleys’ roots, tending the enchanted soil in the family garden from which she makes her sought-after delicacies – famed and feared for their curious effects. She has everything she thinks she needs – until one day she waked to find a stranger has moved in next door and a vine of ivy has crept into her garden …Claire’s carefully tended life is about to run gloriously out of control. 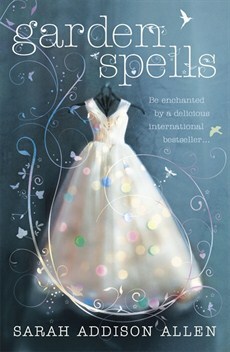 What a magical read!! We loved this book. A beautifully written story that painted gorgeous pictures. Very sweet and filled with optimism. Great characters (Evanelle was a favourite) and we also loved the cooking element. We really enjoyed this book. Would definitely recommend to anyone who loves a good “chicklit” read. This entry was posted in Book Club Kits, Book Reviews, Fiction, Recommended Reading, Staff Favourites by Parra Reader. Bookmark the permalink.